Mac cloner and enduring litigant Psystar has rolled out a new $50 application that will allow certain Intel-powered PCs to run Mac OS X. The Florida-based company announced Thursday that any PC with an Intel Core 2 Duo, Core 2 Quad, i7 or Xeon Nehalem processor installed can take advantage of its Rebel EFI software hack to run Mac OS X 10.6 Snow Leopard. The "Rebel" hack is likely to get the company in even more hot water as an ongoing legal battle with Apple continues over Psystar's unauthorized computers that ship with Mac OS X preinstalled. Psystar and Apple have been embroiled in a legal controversy over Mac OS X usage since July 2008. Thursday's announcement signals another frontier for the bold company beyond selling Mac-booting hardware. Psystar's website includes 38 steps of instructions for installing Mac OS X with its new Rebel EFI tool, with one part of the process that takes 13 separate steps to complete. "Featuring Psystar's newest technology for allowing for the smooth interfacing between operating systems and generic Intel hardware," the product description reads, "Rebel EFI allows for the easy installation of multiple operating systems on a single system." The software is priced at $89.99 at The Psystar Store, but is currently listed with a "special" $40 discount. The company offers it free to try, but with limited hardware functionality and a two-hour runtime. 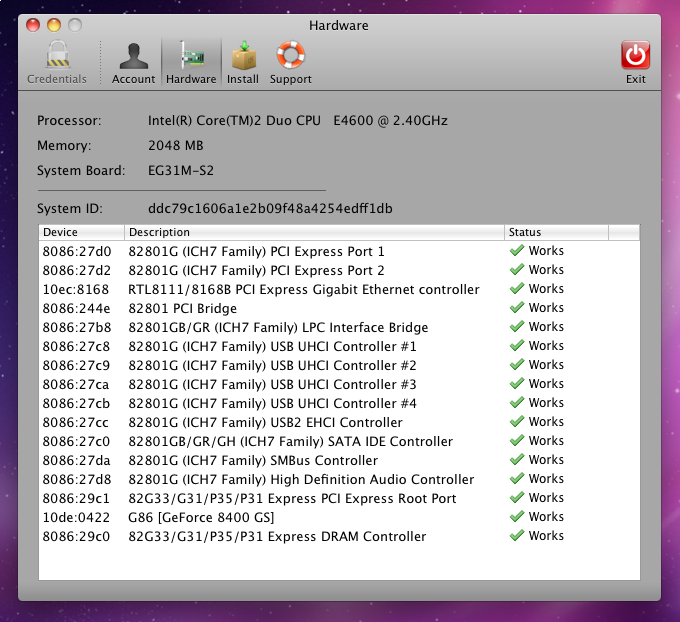 Rebel EFI also runs a hardware scan (seen below). "The authenticated version allows for the permanent installtion [sic] of these OS's on your system, as well as providing the [Darwin Universal Boot Loader], supported hardware profile features and related drivers, and support for the application," Psystar's site states. Earlier this month, Apple and Psystar both requested summary judgment in an attempt to head off a January trial. That news came shortly after Psystar announced it will sell Snow Leopard virtualization technology to third-parties —the same technology included in the consumer-targeted Rebel EFI. Apple has yet to comment on the latest development in this ongoing saga.